The Phils lost tonight by a 5-1 score in a game that was actually much closer than the final. The score was 2-1 St. Louis in the bottom of the 8th inning, when Charlie Manuel decided that Joe Blanton on his 90th pitch was a better option than Jose Contreras, Brad Lidge, and Ryan Madsonto keep the game at 1 run. Shockingly, Joe Blanton allowed all 3 batters he faced to reach base, 2 of whom scored while he was still on the mound. Then Manuel thought it was the right time to take Blanton out! Why use your bullpen in a 1-run game? Just use them unnecessarily in a game that's already out of reach. Blanton was only at 97 pitches: if he was good enough to start the inning, then he is absolutely good enough to get out of a one-man on, no out jam. Terrible managing, but this was simply Manuel's last bad move of the night. The worst move of the night came in the top of the 7th inning when the Phillies had runners on first and second with one out for Cody Ransom, who was inexplicably batting in the 7-hole in front of Carlos Ruiz. This is just embarrassing. The Cardinals were able to retire Ransom, then they deliberately walked Ruiz, the Phillie with the highest OBP this year. Awful by Manuel to let that happen. Joe Blanton then came to the plate with two outs. 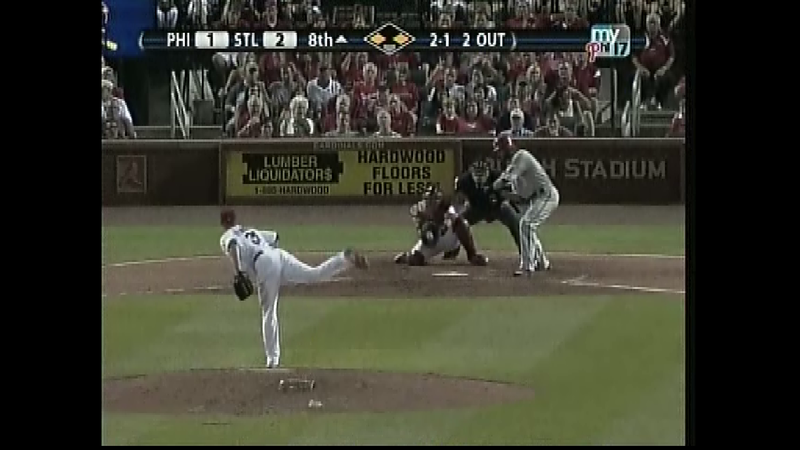 Instead of using righty Wilson Valdez to hit against the lefty Jaime Garcia in this situation, Manuel let Blanton bat. He struck out. In that situation, you have a 32.5% chance of scoring a run. When the batter is Joe Blanton, however, that number falls to at most 10 percent. Is that 22.5% chance really made up for by letting Blanton pitch the next inning instead of Contreras. Hell no. Letting Blanton bat there is borderline insane. The lineup is bad. Manuel's not as bad, but he's very very close. As for the umpiring, the home plate ump was terrible. 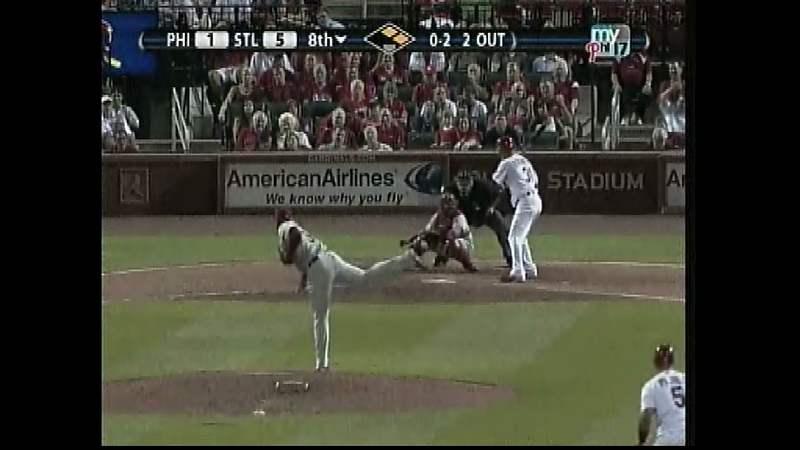 The pitch to Werth above was a 2-1 pitch that was definitely off the plate, and it was called a ball all night. Except for this one. Instead of a 3-1 count to Werth (with the tying run on third base in the 8th inning and the go-ahead run on first), it was 2-2. 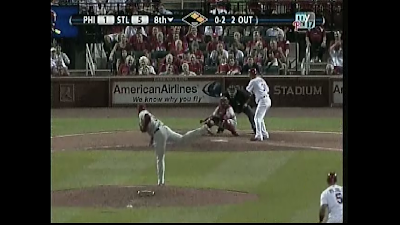 Huge difference, and Werth ended up grounding out on a similar outside pitch. 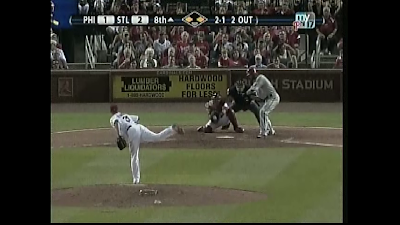 The other picture above is a pitch to Ryan Franklin, also off the plate (actually closer than Werth's, though). It was called a ball. Thanks blue! Click on the pictures for a larger image. Tomorrow the Phils probably get swept at 2:15 pm when Cole Hamels faces RHP Adam Wainwright.